Tilt Pinball, an arcade in Louisville, US, has added an extensive virtual reality section to its offering. Having moved two years ago from its location on Front Street, Tilt now features a full bar and access to the two restaurants with which it shares the space, Verde and Shopey's Pizza. While the basement feels like a traditional arcade filled with neon lights, the upstairs loft where the virtual reality booths are located looks like a modern event space with hardwood floors and areas to quietly hang out. 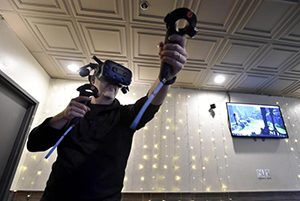 Thanks to growing popularity in the corporate world, according to Grand View Research, VR gaming is predicted to reach US$45bn in revenue by 2025. While industry experts attribute much of the growth to the expense of purchasing home VR systems (upward of $2,000 for a top-of-the-line wireless HTC Vive Pro system like those at Tilt), with the technology improving so quickly, they predict best systems will likely remain out of financial reach for home users for quite some time. All of the testers Tilt brought in prior to the Friday grand opening expressed similar amazement with the graphics. The site has three HTC Vive pro stations complete with the wireless headsets that allow users to freely move around so they enjoy the experience alongside friends. Its games include Creed: Rise to Glory, which allows players to box against iconic characters from the Rocky movies, Tilt offers more than 30 games ranging from a Lord of the Rings-esque game in which players shoot ogres with a bow and arrow from the towers of gothic style castles, to a table tennis game where players can feel the ball bounce off their virtual paddles using a technology called haptic motion. Tilt even has a Google Earth app that allows users to stand on top of Mount Everest or the Great Pyramid of Giza and take in a 360-degree view of the surroundings. The immersion is made complete with noise-cancelling headphones that pump in natural background noise.